Country Summer fans are coming from 35 states and four foreign countries this year. 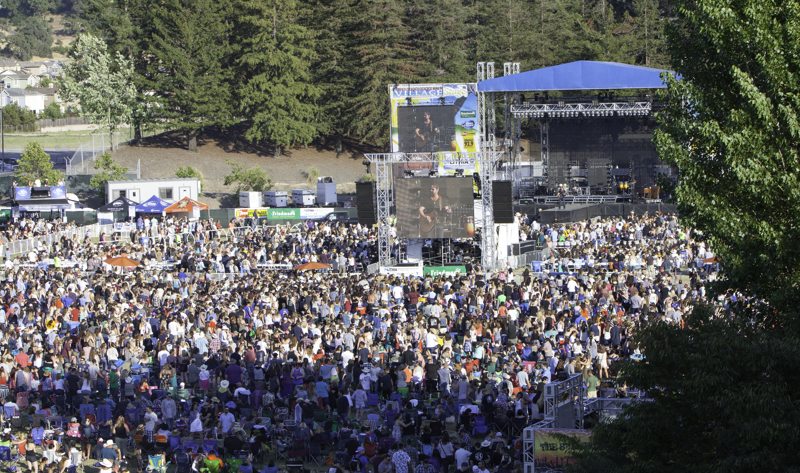 In its third year, Country Summer, Northern California's biggest country music festival, is June 3 to 5 at Sonoma County Event Center at the Fairgrounds, 1350 Bennett Valley Road. Headliners on the Chevy Silverado main stage are two megastar hit-making country music trios and a renowned platinum-selling artist -- Lady Antebellum on June 3, The Band Perry on June 4 and Billy Currington on June 5. On tour again this summer, Lady Antebellum earned rave reviews for its rendition of the national anthem at The Kentucky Derby on May 7. The band has achieved crossover success, superstar status and a multitude of awards, including “Vocal Group of the Year” honors from both the CMA and ACM three years in a row. Back by popular demand, The Band Perry is the first repeat headliner in Country Summer’s three year history. The band’s colossal stage presence, strong vocals and contemporary country music style was a great success in 2015, and the siblings will back in the Saturday night spotlight this year. It’s apropos for famously laid-back, warm weather aficionado Billy Currington to perform at Country Summer. Summer Forever, released in 2015, is his sixth studio album. “Summer Forever for me represents a positive, happy good time lifestyle, and that’s what I want fans to feel,” he said. Other artists include Craig Morgan, Chris Janson, Chase Bryant and Casey Barnes winner of the Fender Contender Challenge, on June 3; Kip Moore, Chase Rice, Kristian Bush of Sugarland and McKenna Faith on June 4; and Josh Turner, Frankie Ballard and Old Dominion on June 5. Country Summer fans are coming from 35 states and four foreign countries this year. Last year, more than 38,500 Bud Light beers were poured, validating the event’s reputation as country music destination party. There’s also the Kendall-Jackson Wine Garden, Jack Daniel’s Saloon, Tito’s Handmade Vodka stations and a variety of great food – from quintessential deep-fried county fair favorites to more sophisticated, organic cuisine. The music never stops. Between acts on the Chevy Silverado main stage, American Stone, American Honey and Ryan Scripps will keep concert-goers entertained with performances on the Santa Rosa Stage. While country music artists are the main attraction, great festivals are more than great music. Gates open at noon. Music begins at 1:30 p.m. each day of the Country Summer festival. General admission tickets are $79 per day. Single-day reserved seats start from $99. Country Summer tickets are on sale now. Visit http://www.countrysummer.com or call 800-514-3849 to order by phone. Event sponsors include Bay Area Chevy Dealers, Bud Light, Friedman’s Home Improvement, Les Schwab Tire Centers, Kendall-Jackson, River Rock Casino, Jack Daniel’s, Mary’s Pizza Shack, American AgCredit, Montgomery Village, Tito’s Handmade Vodka, Harris Ranch, Cattlemens, Creams, Papé Material Handling, Visit Santa Rosa, Liftmaster, Xfinity, Marines, Interstate All Battery Center, Mobile Mini, Fender and Froggy 92.9. Lady Antebellum headlines on June 3, The Band Perry headlines on June 4 and Billy Currington headlines on June 5.Country Summer Frankie Ballard makes a repeat performance in 2016. The Country Summer setting in Santa Rosa, California.